There's been a discussion the last few days about how to hold the models when painting on my favorite Yahoo Group, STMFC,(steam era freight cars). I thought I'd take this opportunity to show how I've dealt with the issue. It's actually fairly simple to make and works a treat. Wood for the handle and the T-bar, which is slotted using a router bit. You can do this, working slowly, in a drill press. Or clamp the wood in a vice and use an actual router if you have one. The two legs are made from bent brass to form the 2 angles and a length of brass tube for the leg. Those are simply soldered together. The two angled bits are drilled for machine screws. As you can see a simply secure the tool to the model using the truck mounting screws in the bolsters. I can now spray all surfaces without having to touch the model. And a small screw-eye is inserted in the end of the handle so I can hang the whole assembly up while the paint dries. With one tool I can adjust it to fit 40', 50' freight cars, passenger cars, and S and O scale cars. I actually have a number of these. Best homemade tool I ever made. The CPR war emergency car is now for sale! 6 months late, but it is worth the wait. I'm very pleased with this model and have no doubt that buyers will be as well. If you're interested in purchasing a kit, visit http://yarmouthmodelworks.com/ and view the ordering options. By now you've probably heard that Testors is ceasing production of Floquil, Pollyscale, Model Masters and other hobby related paints. Sad but true. It would appear that the new corporate masters, Rustoleum, are consolidating and condensing operations and product lines. In part they are blaming the steady increase of RTR products and a decline of modelers who actually paint their models. Well I know of a few thousand modelers who would beg to differ, but who are we against the great corporate behemoth? Personally, I'm not surprised. Disappointed and a little irritated, but I will live. On the upside I was entertained by the customers who have suddenly bombarded my local hobby shop with paint orders for Floquil. Too bad that it will be almost impossible for the orders to be filled. I was there buying up a supply for myself. The general tone I've been hearing is, 'What are we to do?". Simple, try something else. While I for one can't stand working with acrylics, many people get great results. Try Scalecoat, or Tru-Color. This decision by Testors will be a boon for the other 2 I've mentioned. Now I know that for Canadians, getting solvent based model paints is hard. None of the carriers seem to be able to carry it across the border. And yet USPS will mail Scalecoat within the continental 48. Now there's a puzzler for you! Anyway, the long and the short of it for me is, we will adapt and move on. I have my methods for getting what I need and if need be I'll learn to use some new products. It's Not Just freight Cars Around Here! While waiting for other things to dry, I took sometime to work on layout details. Namely telegraph poles. According to the chart at the back of employee timetables I have for the Cayuga Sub, the area I'm modeling only had the one crossbuck. So I grabbed a supply of Rix Products telegraph poles and glued the cross bucks in place. 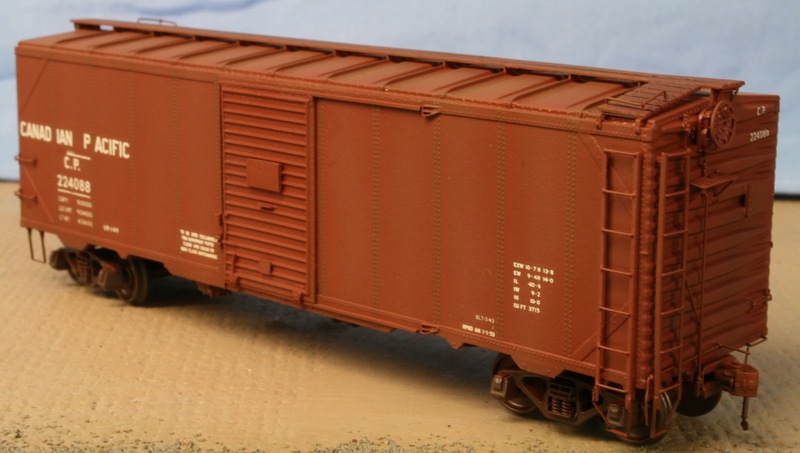 A quick spray with grimy black overtop of the brown plastic results in nice weathered creosote look. The insulators require a special touch. They are first painted with a silver paint and once that drys, Tamiya transparent green is applied over top. They really look like glass! Now to mount on the layout. With airbrush service restored, I could finally finish and weather the SAL B-7 I'd been working on. These "Turtle roof " cars are neat and with proper pattern work and one piece body castings the look of these cars is well captured. There are some issues with the kit and I chose to change some details, but that's my thing. Aside from the bolster issue I've already discussed, I'm very disappointed that a correct door for this car wasn't created. Maybe I'm getting too fussy. My good friend, Trevor Marshall, has written an excellent blog post about 3D printing. I see Rapid Prototyping as a tool, not a means to an end. The technology has it's place, but it will not replace craftsmanship and practical knowledge. Been a tad goofy around here of late. My airbrush went south on me and I've waiting for a replacement. Unpainted rolling stock is starting to pile up, to an unacceptable level, so I've taken to opportunity to work on the layout some. I've been focusing on the Jarvis station scene and to the east of it. First is what the area looked like a couple of months ago. With the usual modeling weapons in evidence. After I was given the model of the station from Rich's estate, the Highway 6 was put in and the crossing gate control shed was added. That little guy is the top of an elevated crossing tower from Fast Tracks. A dead ringer for the original. Behind the station is the northwest leg of the wye and the mainline for the Hagersville Sub. For my purposes it consists of 2 short staging tracks for the 2 Hamilton originated trains. The tracks are covered by a cloth to allow me to photograph other things. Yesterday, I got the first coat of paint on the new partial back drop that hides the Hagersville Sub staging. As you can see, scenery work continues in the area. In the foreground I'm experimenting with Silflor tufts, which I'll be using in conjunction with static grass and other traditional ground covers. The plan is to also have working train order boards once the equipment is delivered. Until then the train order board will remain unsecured. I have only a couple of lineside structures to build for just beyond the station and then it's all scenery all the time for this area. All of the industries for Jarvis are actually just to the right of the benchwork as viewed in the photos. For operation purposes I'll just have to make labels for the fascia to mark the locations. It maybe hard to believe, but after decades of removal of rail and rail infrastructure, track is again being laid in St Thomas, ON. The "death spiral" began in the 80s when C&O pulled out of Canada and removed all of their track and demolished the facilities that used to exist in the south end of town, including the steel trestle that crossed the Kettle Creek valley. Shortly there after the slow, painful destruction of the Canada Southern, with chunks of the right of way being lifted at different times. And the prolonged struggle between Elgin County Railroad Museum and CN/CP to acquire ownership of the old erecting shop to house the museum and it's collection. More recently chunks of the old Air Line, formerly the Wabash/CN mainline connecting Windsor to Fort Eire, were lifted. Fortunately there is still activity on part of this line, between St Thomas and Delhi. But everything east of Delhi is long gone. At some point, unknown to me when, the mainline of the old L&PS was removed through the centre of town. From the 3 way switch at Barwick St, south to the interchange between the L&PS and the CASO. It is this track that is being replaced. At least most of it. The city has decided to fund the restoration of the L&PS right of way in the centre of town along with a new replica of the original L&PS station. Work is well underway and we should be able to see the first trains from Port Stanley arriving in downtown St Thomas in a couple of months. A future reconnection to the remaining mainline to London is hoped for, but remains a protracted debate with CN. Politics aside it's neat to watch rail heritage being restored. Looking south with the original roadbed of the CASO at the orange markers. How's that for a piece of Snap Track? Now that's subroadbed! No Homasote for these cats. Standing on what's left of the CASO, looking west, with the LP&S track just in front of us. The new switch which will allow trains to either head north to the station or east into the old CASO shop grounds, now home to the Elgin County Railway Museum. I'm very much looking forward to seeing this little gem finished. Now if someone would fund a steam train in town, we'd be all set.